Untamed and unforgettable, Indonesia is rich in natural beauty and distinctive wildlife. And perhaps no creature is more remarkable than the world’s largest lizard: the Komodo dragon. 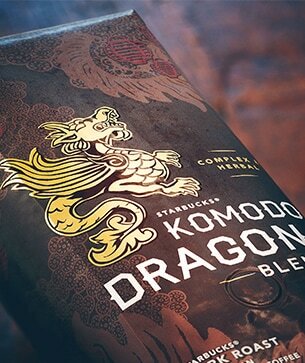 Like that beast, this coffee is bold and surprisingly snappy. It was also, until recently, just as rare as that elusive and endangered animal. We first sold this blend by mail and online orders only. But it became such a customer favorite that we unleashed it within our stores as well. It’s an assertive combination of several Asia/Pacific coffees: part bright, biting acidity and part earthy, loamy smoothness. Full-bodied and bold. Earthy and layered with notes of fresh herbs and a lingering spice.